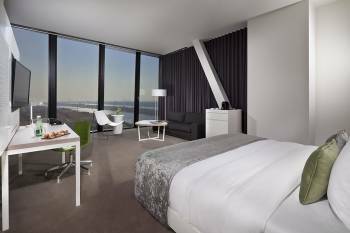 The lifestyle Meliá Vienna Hotel is situated in Austria’s tallest building and boasts spectacular views of the City and the River Danube. This landmark property is a distinctive feature of Vienna’s skyline. The hotel was transformed to a sophisticated and fashion-forward business hotel. The hotel is located near the UN Headquarters and Austria’s largest convention centre. We are also only a 6 minutes subway ride from Stephansplatz – the heart of the city!All 253 stylish guest rooms and suites are equipped with media hubs and floor to ceiling windows allow for awing views. Three F&B outlets: Roof Top Bar (Floor 58th), Meliá Restaurant (Floor 57th) and Lobby Level will spoil you with amazing views and culinary specialities from traditional Viennese, to new Mediterranean cuisine. 717m² of Meliá Event Space with Foyer and Balcony as well as seven break-out rooms allow for great events and meetings. Whether it’s an intimate board meeting or a large conference, the Meliá Vienna offers the perfect setting from the highest spot in Vienna to make your event a success.Enjoy the benefits of 1,079 sq m of modern and flexible event space. The hotel´s Grand Ball Room, located on level one, offers the perfect setting for an exclusive gala dinner. The Meliá Vienna also offers eight smaller meeting rooms, located in levels one and three, which are ideal for more private company meetings.Power Meetings brings people together in an environment designed to engage all senses and inspire fresh minds.Every detail is orchestrated to maximize the experience from an individual perspective. www.conferencehotels.eu offers you a free and comfortable search for conference hotels in Vienna. Here you will find the most popular conference hotels which Vienna has to offer and which you can request directly online with the best conditions available.